This city raised me. Actually, considering our tradition of education, it may be more appropriate to say Boston taught me. This city taught me how to see history come alive in old meeting halls and pubs. It taught me the unity that sports can bring through the championships of the Sox, Celtics, Bruins, and my beloved Patriots. Boston taught me how to navigate like a true New Englander: hang a right at the Dunkie’s and go straight. As a lifelong Boston resident, the events of the past week intersect with so many elements of my life and elicit a diversity of emotions. When the bombs detonated at 2:50pm on Monday, my professional and personal lives simultaneously shifted into high gear. Amidst the blizzard of texts I received in the minutes and hours following the blasts – all of which read nearly the same message “I’m OK… are you alright?” – my mind and energy could only focus on my job: ensuring the safety of Boston College students. I have two assistantships at BC: one in Residential Life working with first-year students and one in the Office of the Dean of Students working with our off-campus communities – the students and neighbors of Allston, Brighton, Brookline, and Newton – and their stakeholders, most notably the Boston Police. On Monday that meant I was both securing a building on campus and caring for its residents while reaching out to those I knew in the Boston Police Department to let them know I and Boston College were ready to help however we could. Throughout the day, I witnessed many things that moved me. I saw RAs consoling runners who had been yards away from the explosions. I spoke with two Newton police officers who rode up to the building on wailing motorcycles, swept through the first floors, checked the main doors, and sped away again. 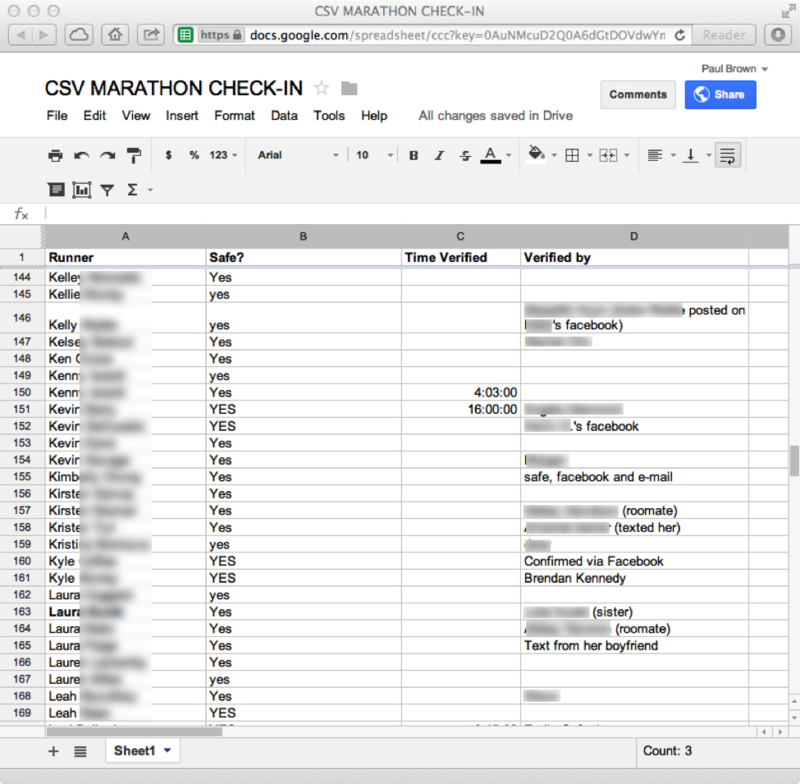 I kept tabs on a Google Doc which listed the runners who were from BC and were unaccounted for. I watched as it was filled with updates from other students with notes next to people’s names such as “He just posted to Facebook” and “She’s OK, just got a text from her.” The speed and power social media had in such a moment of crisis was truly staggering. A section of the BC Runners Google Doc. The hours rushed past like this: hopping from issue to issue, mobilizing one idea and then acting on another. I continued to catch pieces of the news as I moved, but had no time to process them. It was not until much later in the evening that the personal element of the events began to kick back in. I read back through all those texts and voicemails I had ignored. I learned of those injured and heard that the young boy who was killed, Martin Richard, was from my hometown. The three victims represented the very best of Boston: a young Irish Catholic kid; a hard-working new professional; and an international student here to take advantage of our institutions of higher education. Boston’s very identity as a diverse and dynamic city was wrapped up in their stories. The days following passed in a fog. I sat through many meetings, counseled many students, and compulsively checked the news for any sign that our city would be restored to normalcy. I took great solace in the words President Barack Obama spoke in his address on Monday: “Boston is a tough and resilient town. So are its people.” Those who knew this city, who were taught by it; they knew that to be true. On Thursday evening I took the opportunity to get some distance from the situation and spent the night off-campus. I had been struggling to sleep all week as the same thoughts ran through my head: Who should I be checking in on? What more can I be doing? Where are these guys hiding? Why did they choose Boston? I was looking for answers that didn’t exist, trying to find that thing that was going to solve our city’s pain. I had no sooner put my mind to rest when my phone rang with my supervisor’s voice on the other end. In the blur of the call I remember just a few phrases: There was a shootout. The city is locked down. We need you to come in. Fifteen minutes later I was securing a new building, different from the one I was responsible for on Monday. I was knocking on the rooms of RAs who didn’t know me from Adam, asking them to stand by all the entrances and to make sure no one came in or out. For ten hours, they stood by the doors without a single complaint. As I wandered the halls, offering residents Rice Krispies Treats and granola bars (we would later make speedy trips to the dining halls watched by armed police officers to secure lunch and dinner), I noticed that I had again slipped into this “professional’s mindset”. The manhunt was unfolding just over two miles away, yet the RAs, the residents, and I knew what we had to do: shelter in place so our law enforcement community could do its work. Throughout the day, I witnessed not only the flawless execution of BC’s emergency protocols by student affairs professionals across campus, but also the incredible energy and spirit of our students. From snack parties to movie marathons and breakout dance sessions, my residents showed me how a community could come together. When the shelter in place order was lifted shortly after 6pm, students rushed outside to catch the last rays of sun and take in some fresh air. However within minutes the manhunt resumed just across the Charles River, and quickly those same students were huddled quietly around the lounge TV, watching footage stream in and hoping for a resolution. As officers moved in and captured the suspect, a young man so similar to them in age and appearance, the students reacted with somber acknowledgement. Some clapped softly, others prayed, but everyone knew that Boston was back to being Boston. In my reflections since that fateful week, I’ve realized the diversity of reactions people have to crisis. My decision to focus of my professional duties just seemed natural at the time; students needed help and my job is to provide that as best I can. However, achieving that required managing and in some instances blocking out the personal impact of the tragedy. That was not asked of me nor was it something I thought about as I did it. I suppose it is just part of the difference in how people process; doing something helped me cope. As things calm down, I am going to spend some time reflecting on how I deal with crisis. Doing that will give me some small sense of good coming out of what has been so much bad. Brendan Kennedy was a Master’s candidate in the Boston College Higher Education program and a Graduate Assistant in Residential Life at Boston College at the time of the Boston Marathon tragedy. The author’s views are his own and do not represent those of any institution, entity or individual. You can reach out to Brendan directly via tweet or email. Please feel free to share this on your social network of choice using the link icons below. We also welcome you to share your reactions and stories in the comments section below so we may all benefit from your thoughts and wisdom.